As revealed by thousands of emails Donald Trump's pick to head the Environmental Protection Agency (EPA) is an enemy of the planet and a friend of the fossil fuel industry. Pruitt was forced to release his emails by a court order just days before he was confirmed by the Republican-controlled Senate. The emails were released in response to a request from the Center for Media and Democracy (CMD). To no one's surprise, these emails reveal the close collaboration of Pruitt with industry and fossil fuel interests in particular. The revelations contained in these emails corroborate what we already know. Pruitt is a lobbyist for industry who has sued the federal government 17 times. This includes lawsuits against the EPA's clean air and clean water regulations. Pruitt has a long-standing secretive alliance with big energy interests. Especially the fossil fuel industry which has a deplorable track record of malfeasance that includes blatant disregard for clean air and clean water. Pruitt is charged with providing oversight to the same companies that have supported him financially and politically. However, generous campaign contributions are only the tip of the proverbial iceberg. Pruitt's first remarks as EPA administrator almost ignored the environment altogether and never mentioned climate change once. He did, however, say that he wants to limit regulation and support industry. 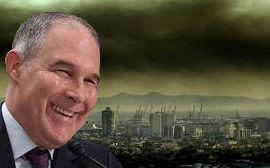 Pruitt puts the well-being of industry ahead of people's health and this makes him a friend of polluters and an enemy of the American people.